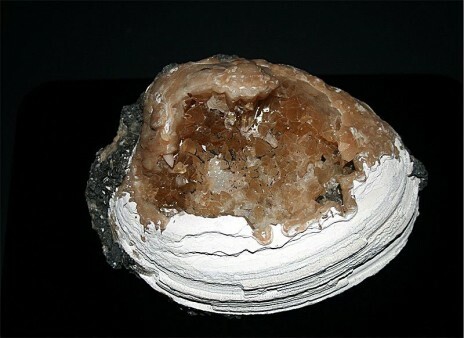 A Fossil shell with Calcite Crystals. New study by geologist Christoph Korte from University of Copenhagen, Department of Geosciences and Natural Resource Management, provides documentation to explain a previously not understood major change in temperature during the Jurassic. Whereas the origins of warm periods during the Jurassic (201-145 million of years ago) are well investigated, there has so far been a poor understanding of the mechanisms behind changes into cooler periods. Explanations based on levels of CO2 are often used to explain this kind of change, but they could not be used in the case of one of the major shifts during the Jurassic with cooling of seawater by as much as 10 C. The study refers to the Middle Jurassic, about 174 million years ago, in the so-called ‘Laurasian Seaway’, an area that connected the Tethys Ocean between current Africa, Europe and Asia to the Boreal Sea in the Artic area, through the former Viking Corridor between current Norway and Greenland. Christoph Korte has been gathering data over the last 12 years to elucidate this event, resulting in a new data set unprecedented in terms of degree of detail and precision of layers analysed for the period of time between 191 and 168 million of years ago. Together with several colleagues, Korte has analysed marine calcite fossils from selected European basins in Scotland, Yorkshire, Portugal, Spain, and Germany. He has also studied migration patterns of small mollusks. While relating levels of carbon in the atmosphere did not provide any explanation for the dramatic climatic change, a new hypothesis was developed by the researchers based on movements in the Earth’s upper crust. The uplift of the North Sea Dome, an area some 1000 km diameter centered on the present day North Sea obstructed a northward flowing seawater current through the Viking Corridor, leading to strongly reduced heat transport to the Arctic region. On the other hand, cold waters from the Arctic were able to exert influence in areas as south as current northern Spain. The major change of climate that the new current patterns caused had strong implications on the local fauna, as indicated by the documented changes in the distribution of invertebrate fossils. This hypothesis developed by Korte and his colleagues fits well with other changes in temperature documented from the Arctic region.